I've been using RouteBuddy for several years now and find it excellent both for route-planning and for use in the wilds with print-out maps. Most recently I used RouteBuddy for the TGO Challenge. 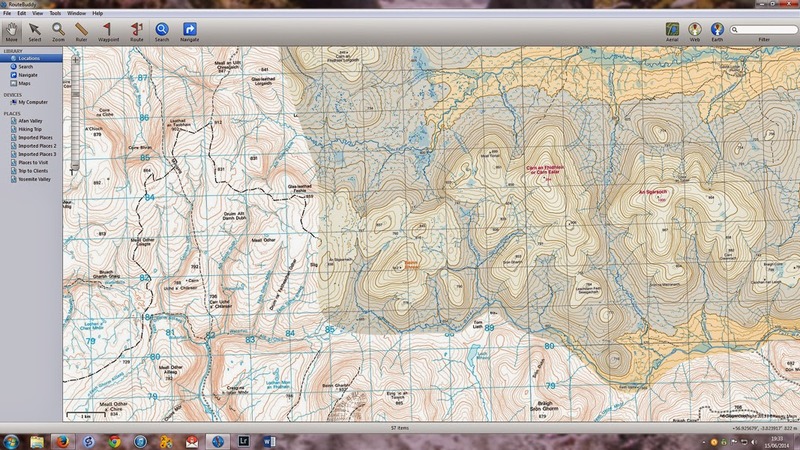 I've just written a review of the software which you can read on The Great Outdoors website here. Good article. How did you navigate whilst on the actual route? Do you use Routebuddy App for a phone or something similar? Thanks Neil. I printed out the maps with the route on A4 sheets. As a backup I had the ViewRanger app with OS maps on my phone - as I say in the review RouteBuddy is only available for iPhones and my phone is Android. Given that you pretty much embrace new technology and use it in the hills do you ever wonder why the reaction of so much of the outdoors establishment is against new ways of doing things? I've been wondering that for years! Long before GPS etc came along. I can remember 30 years ago the first fabric footwear and lightweight synthetic clothing was derided as inadequate and dangerous. I think it's that the outdoor establishment tends to be made up of people who've been around a long time and learnt their skills decades earlier. What worked fine when they were young is best to many people. Being a gear reviewer I've always tried to keep an open but critical mind. I judge a digital mapping program by the currency of the maps that the company offers with it and have found Routebuddy to be significantly lacking for New England, USA along that dimension. The maps they provide are based on 1950's USGS data that is way out of date. The software itself can be marvelous, but if you load garbage data in, you get garbage routes out. Amongst commercial programs, I've found Viewranger USA to be much better for New England because they provide a more up-to-date hiking trail overlay layer over USGS topos. But you can't beat the price of Caltopo.com, which is free and has very sophistcated map printing and collaboration capabilities built in, but is only web-based. When you think of inspirational mountaineers of the past such as WH Murray they were always trying out new gear. He writes about how the improvements in tents in the 1930s made it possible to camp out on the summit of Ben Nevis for New Year. They have been promising the Android version for quite a while. They need to do it as a very good deal now to compete with ViewRanger on Android. Thank you for the review. Now I can make my decision. I use Viewranger but the map print outs aren't very good? Is Routebuddy better for this? RouteBuddy is excellent but I would suspect that it's printer quality and settings and paper quality that determine print-outs. On standard settings and cheap paper my printer churns out blurry hard to read maps. With best quality settings and glossy paper the maps are fine. I've been using Ordnance Survey's OSMaps. Its £3.99 for a month usage or £20 for the year and provides access (both Explorer and Landranger) to the whole of Great Britain. You can select your area and print to A4 or A3, portrait or landscape. I print to a pdf and then get the local copy shop to laser print the A3 maps, which is a very good quality print, water proof too. It has route plotting and recording but I've not tried this. Its much cheaper for me than buying all the OS maps for a given route for RouteBuddy, if I intend to traverse an area covered by a load of maps on my route. Maybe a good budget solution.